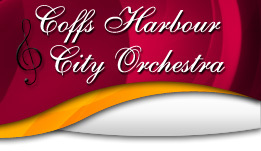 Welcome to the COFFS HARBOUR CITY ORCHESTRA website! The world of orchestral music – hard work, but lots of fun for music makers and audiences. Coffs Harbour City Orchestra is your community orchestra, made up of people of all ages who enjoy making music. New players are welcome. You do not have to be a world class instrumentalist, but you do have to enjoy playing music. Coffs Harbour CWA provides the rehearsal venue. Website sponsored by Optic Empire. Our conductor is the very talented Tim Egan. Tim is an accomplished musician and teacher with lots of conducting experience and well known to many in the orchestra. In past years he has played first trumpet and assisted with conducting the orchestra so it is great to have him back. If you would like advance notice of concerts email pamela@bioaccent.com.au to be placed on our "Friends of the Orchestra" list. Our next concert is our annual Nambucca Concert starting at 2pm on Sunday 16 June at the Nambucca Community and Arts Centre in Ridge St, Nambucca Heads.....Entry is $15 adults and $12 concession, children free. Afternoon tea is available after the concert for a gold coin donation...lots of home-made goodies and a chance to mingle with the musicians and friends before heading home. This is always a great afternoons entertainment.